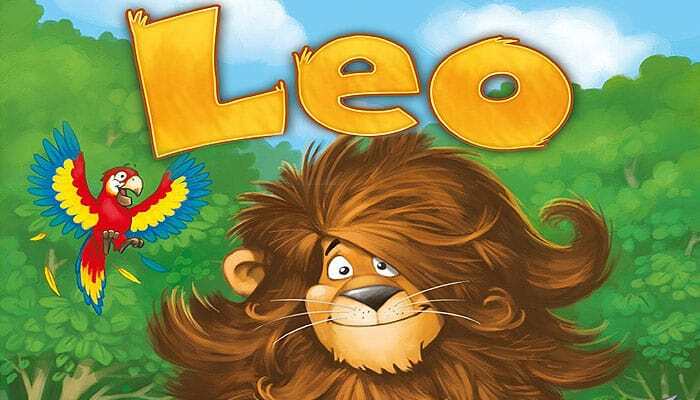 Leo the lion's mane is far too long and he risks looking shaggy and losing the respect of his fellow animals - but those same animals keep stopping him to chit-chat while on the way to a haircut. Can you get this king of the jungle to the barber shop in time? In Leo, players need to help Leo reach the barber shop before it closes for the day. To set up, place all of the animal tiles face down, shuffle them, then create a track that leads from Leo's bed to Bobo's Barber Shop. Set the clock to 8:00 a.m. Each player starts a number of cards in hand. On a turn, a player plays one card to move Leo ahead 1-4 spaces on the track, then reveals the animal tile on which Leo landed. If the tile is the same color as the card just played, the clock remains at the same time as it was at the start of the turn; if the tile has a different color, however, the clock moves ahead 1-5 hours depending on the animal depicted. Poor Leo! If the clock reaches 8:00 p.m. before Leo arrives at the barber shop, the round ends and Leo must return home in order to try again the next day. Turn all face-up tiles face down again. If the players manage to get Leo to the barber shop within five days to get him a trim, they win! Leo the lion definitely has to go to the barber, since his mane is literally growing over his head. So he sets out for Bobo's barbershop. But Leo dawdles, since he likes to have a chin wag with the other animals he encounters along the way. Keep in mind what animals he meets and bring him cooperatively to the barber before his mane grows too long!